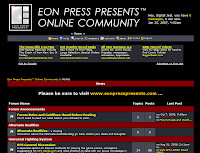 I’m going to go ahead an open up the Eon Press Presents Online Community forums to the public. There is virtually nothing there that you cannot find here on this site, but making the forum available for sign-ups now will save me some work in future. Please feel free to sign up and ask questions. Of course, please abide by the forum guidelines (don’t worry, their very simple.) I will be fielding questions about my comics and Alternate Realities there, as well.